This is one of the finest video projectors available. This is a professional CRT projector. It has far better performance than LCD or DLP projectors. It is amazingly bright, and is ideal for home theater or graphics projection. It is fully HDTV compatible and accepts multiple aspect ratios. Our unit was produced in 1996 and is tested and functional. The ACOM worked perfectly, and the projector produced a bright crisp image. The ACOM automatically sets the convergence eliminating time consuming manual setup and touch-up. Believe me you will really appreciate this feature when you don’t have to climb the ladder to adjust the convergence on your projector. It is good cosmetic condition, and includes both the wired and wireless remote controls. This unit is being sold as is, so please bid accordingly. This unit is very large and heavy, over 100 pounds. The buyer pays for all shipping expenses, which may be significant. No exceptions. * Size: automatically regulated over frequency range and adjustable to 10% overscan 10% underscan * Frequency Range: automatically locks from 15KHz to 80KHz * under 2.5 ms retrace. Unit comes with 1 input module allowing 2 RGB sources to be connected and Quad Standard Decoder module. The Electrohome IR Remote Video/Data Switcher allows use of 6 additional input modules for master control of projector. * The ECF" 3000 can be ceiling mounted on its optional ceiling mount or on a castered cart for portable applications. Due to constant research, specifications are subject to change without notice. 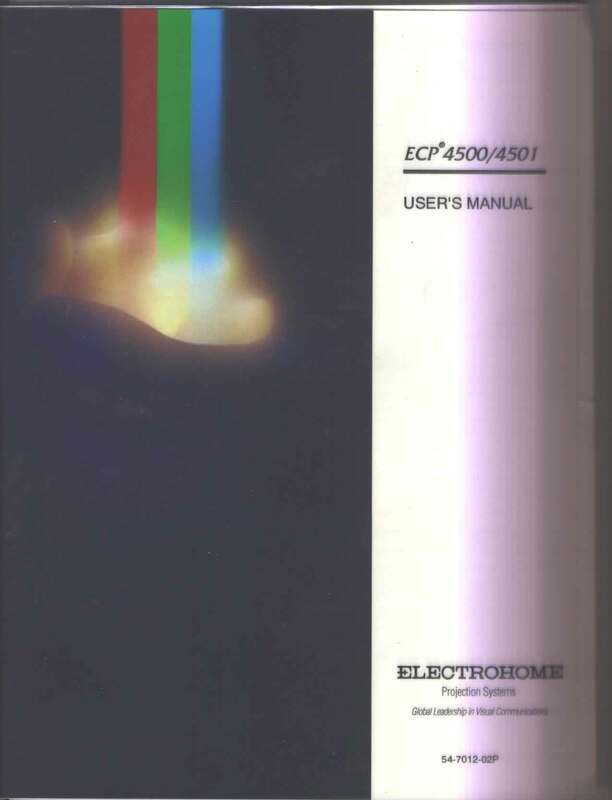 ECP is a registered trademark of Electrohome Limited. Buyer will pay $75.00 packing plus actual shipping in the continental United States. We will make every effort to ship within 24 hours of receipt of payment. We ship with FedEx & UPS only. We will be glad to ship with other carriers using the purchasers shipping account. Please contact us to make any special shipping arrangements. For shipping rate research, our shipping address is Boulder, CO USA ---- Zip Code is 80305.